In the land of the executive diesel saloon, there was only one king – Audi. Incarnation after incarnation of the A4 rolled off the production lines and out of showrooms as quick as Ingolstadt could screw the things together. The four rings just had that aura. Now there’s a handsome big cat waiting in the wings, ready to scatter those four rings. The first thing the XE has to do is make an impression and that it does. It’s looks purposeful, yet stylish with the signature Jaguar grille. It might be one of the cheapest cars in the Jaguar range, but it still had that air of sophisticated and distinction that he competition lacks. When the sun hit the black cherry premium paint (£1200 option) it reflected a deep, rich lustre and set off the nineteen inch alloy wheels (£800 option). The XE diesel engine uses Jaguar’s latest Ingenium design. It pumps out just shy of 180 BHP and a massive 316 lb ft of torque. Only the range topping V6 beats that figure. So, it was no surprise that the 8 speed automatic box was rarely under any strain. In fact, the XE was incredibly swift and agile, given the proportions of the car. During the week I had the car, it returned 45mpg with mixed driving. The gear box offers a range of driving modes, including eco normal, dynamic and a rain/ice/snow modes for those low grip situations. These modes will also adjust varying maps around the engine and gearbox to best optimise the driving style you have engaged. Load space was pretty good and I was able to fit all of my camera equipment in the boot with ease. The split/fold rear seats (£400 option) would be essential for those carrying golf clubs and came in handy on this test car during my time with it. The height of the boot was restrictive is never going to fulfil the needs of busy family life. Inside, the XE seating position is quite low, giving a slight sporty sensation, as opposed to the executive mile muncher that the XE really is.The seats were very supportive and comfortable and indeed the driving position I found was perfect. The brogue leather in this car will be a real love it or loathe it choice choice. Getting into the car was a little awkward I found due to the very low roof line and it took me a few days to adapt so as not to bang my head getting in. The cabin provides plenty of quality and is well put together as expected from Jaguar and with a tilt/slide panoramic roof (£1000 option) is airy and spacious. All of the controls within the cabin are easily within reach. A highlight for me was the 360 degree view of the car which was visible via the eight-inch touch screen. This takes a live feed from cameras dotted around the outside of the car (£1450 option), which allowed you to see the front, rear and both sides when parking. The car comes with DAB Radio, Bluetooth, sat nav, USB & auxilary inputs. Combined with a Meridian speaker system, I thoroughly enjoyed high quality music on my travels. Due to the aluminium construction, the XE has near perfect dynamics. The chassis is just something else when it comes to a decent B Road. For such a large car, it changed direction and steered beautifully. With modern engines, emissions are all too important and as such affect the tax band that a car will fall into; this particular model costs just £30 per annum to tax. Pricing starts at around £35,000 on the road. This test model with its plethora of options, is around £46,000 on the road. 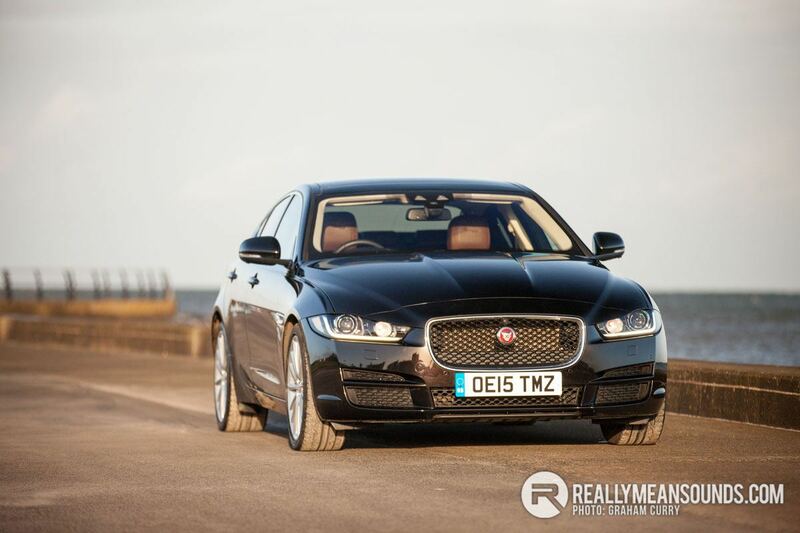 Overall the Jaguar XE didn’t disappoint, it provided everything one would expect and drove fantastically. The diesel will easily be the populist choice. I would personally opt for would be the supercharged 3.0 V6 petrol engine equipped with the automatic transmission. There is no doubt that the XE is a great car, it sets the bar high in the segment. But to say Audi was the yardstick - I'm fairly sure the latest generation 3-series has the market for 2 litre diesels licked. The new C-class can't be far behind either. I'd pop the A4 in 3rd place! That's surely XF territory, the XE is a smaller car. I think with the V6 petrol engine it would be the best of them all, the handling of this XE was shockingly great !!! Good work on getting this Graham, not even seen one on the road as yet !